IMAGES: Contact Michelle Parks at 479-575-4704 for a print-quality image. FAYETTEVILLE, Ark. – The University of Arkansas Community Design Center has received a national award for a housing design that regenerates the urban context of downtown Fayetteville as an arts district. 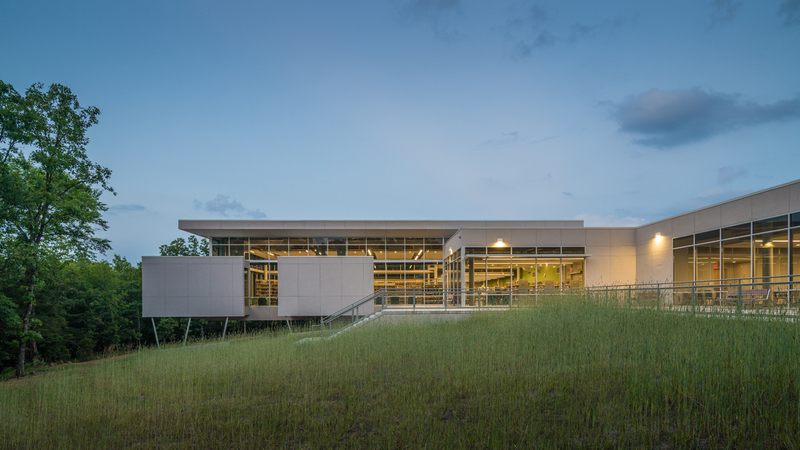 The Community Design Center is an outreach program of the Fay Jones School of Architecture. The Community Design Center won a 2014-15 Association of Collegiate Schools of Architecture/American Institute of Architects Housing Design Education Award for Four Urban Housing Narratives: Getting the City to be a Master Developer, work that was done in the center’s fall 2013 architectural design studio. This project was one of two this year to win the award, which recognizes the importance of good education in housing design to produce architects ready for practice in a wide range of areas and able to be capable leaders and contributors to their communities. Downtown Fayetteville, like many cities, has mostly seen suburban development solutions over the last 25 years because that is what the market rewarded. This proposal, funded in part by a National Endowment for the Arts grant, establishes an urban vision and accompanying pro forma standards by which the city and the Fayetteville Chamber of Commerce could control the development of its downtown holdings. The goal of the project is to transform a city-owned parking lot on Dickson Street into a pedestrian-oriented residential anchor for the city’s downtown arts district. Housing configurations delineate new public spaces while creating housing options for those who want to live downtown, including underserved middle-class constituencies. The project revives a missing middle scale of multi-family housing characteristic in high-quality urban neighborhoods –townhouses, urban flats, mansion apartments, patio units and terraced housing. Four Urban Housing Narratives: Getting the City to be a Master Developer is a collective of proposed housing designs from four student teams who worked with the school’s Community Design Center staff to prepare an urban revitalization approach. The four plans, ranging from lean to ambitious, feature multi-family housing in tandem with a $32 million expansion to the Walton Arts Center and streetscape improvements for West Avenue. Each approach addresses market challenges in financing, return on investment in structured parking, vertical mixed-uses, elevator expenses and incremental implementation, providing city officials with comparative options to elicit an informed public discussion on development features. The four design approaches also address public-policy challenges in downtown development regarding parking solutions, context-sensitive street design, and inclusionary housing. Advertisement for a design/development team will be conducted once the School Avenue parking garage is completed next year. One of the design approaches in the project would alternate parallel bands of public space and housing rows to ensure high-quality urban landscape frontage for all housing units, and is the only approach of the four that relies solely upon surface parking without the need for costly structured parking. A second design approach would cluster micro-scale housing pockets and open spaces, giving a high-density solution a low-density feeling that is familiar to most people. The third design approach would provide a town plaza to accommodate festivals and maximize event space, projecting a strong civic identity around which mixed-use housing and commercial functions are arranged. The fourth design would stack housing into dramatic terrace formations, providing the downtown arts district and the region with a powerful new architectural icon that complements the arts center. Here, the Nadine Baum Studios plaza acts as a terminus for the Art Loop, which provides galleries, retail shops and restaurants along West Avenue in support of an expanded arts center. The fourth design also provides the highest residential density, which helps absorb the higher construction costs associated with the terracing of building levels. This is the Community Design Center’s fifth ACSA/AIA Housing Design Education Award. The program has given 20 such awards nationwide in its eight-year history. This year’s winning projects will be featured at the 103rd annual meeting of the ACSA, planned for March 19-21, in Toronto. All award winners will be published in the forthcoming 2014-2015 Architecture Education Awards Book.